We love Robots here at Fun Kids – just look at Robot, our Breakfast presenter! 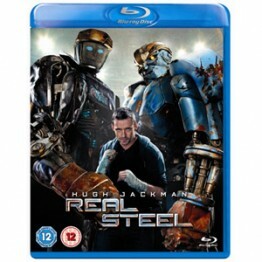 – so we’re excited that DreamWorks Pictures’ Real Steel has finally come out on Blu-ray™ and DVD! Real Steel stars Hugh Jackman as irresponsible ex-boxer Charlie Kenton who has been lost since boxing went high-tech and 2000-pound, 8-foot-tall steel robots have taken over the ring. But when he gets reunited with his son Max and the pair discover an old, very special robot called Atom, Charlie gets one last shot at making a triumphant comeback. To find out all about it, Luke caught up with him in The Club. Here’s the Real Steel trailer for you to enjoy.